The book breaks new ground in the analysis of the political representation of immigrants and visible minorities both theoretically and empirically. 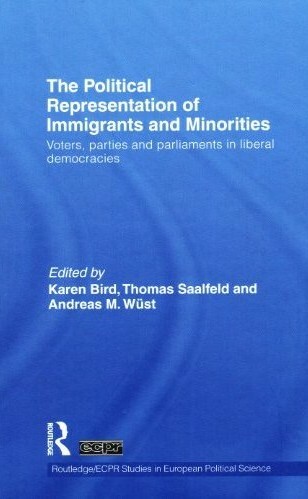 It examines the upward trend in migrant and minority representation and demonstrates that there remain crucial differences across liberal democracies in the timing of these developments, in channels of access for minority representatives, in the policy focus and outcomes of minority representation, in the nature of the connections between minority representatives and minority communities and in the nature of their relationships with constituents at large. The volume will be divided in three main parts: Part I analyses immigrants and visible minorities as voters, who must be the starting point of any analysis of political representation. Part II deals with the stage of candidate selection within political parties, a crucial stage in the process of political representation, which is under-researched in the comparative study of visible-minority representation. Part III deals with immigrants and members of visible minorities, once elected to parliament and includes case studies on the Canadian Parliament, the US Congress, the German Bundestag and the United Kingdom Parliament. This original volume will of interest to students and scholars of migration and ethnicity studies and political science, especially those with an interest in political representation, democratic institutions, voting behaviour, party organisation, legislative behaviour and comparative politics. Karen Bird is Associate Professor in the Department of Political Science, McMaster University, Canada. Thomas Saalfeld is Professor of Political Science at the University of Bamberg, Germany. Andreas M. Wüst is Research Fellow at the Mannheim Center for European Social Research, University of Mannheim, Germany.